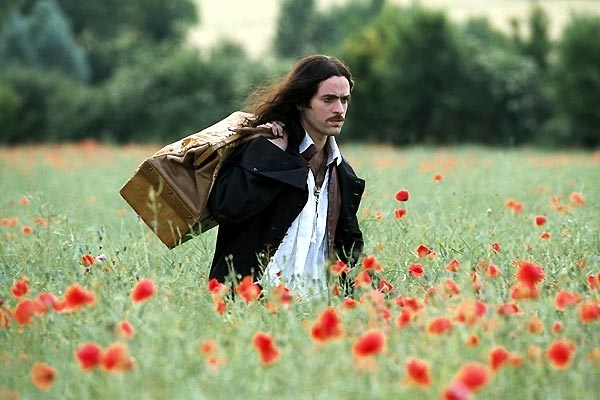 Laurent Tirard’s sumptuous and seductive comedy, MOLIERE, starring Romain Duris (The Beat That My Heart Skipped) in the title role, will open across the UK on July 13 . Fabrice Luchini, Laura Morante and Ludivine Sagnier co-star in this highly entertaining fictionalised account of the mysterious ‘lost months’ in the celebrated playwright’s life. Paris,1644: 22-year-old Jean-Baptiste Poquelin is not yet the writer recognised by history as Molière, the father and master of comic satire, author of The Misanthrope and Tartuffe, and a dramatist to rank alongside Shakespeare and Sophocles. Far from it. He is, in fact, a failed actor. Awash in debt and pursued by bailiffs, Jean-Baptiste persists in staging tragedies in which he acts (badly) until one day he disappears, having been imprisoned by his impatient creditors. Romain Duris’ riveting performance in Jacques Audiard’s hit The Beat That My Heart Skipped brought him international acclaim and as a result, he is arguably France’s hottest young actor. He has worked extensively with Cedric Klapisch, Tony Gatlif and Christophe Honoré and will soon be seen in the latter’s Dans Paris. Fabrice Luchini’s impressive feature credits include Patrice Leconte’s Intimate Strangers, Yves Angelo’s Colonel Chabert, Claude Lelouch’s All That….For This?, Claude Berri’s Uranus, Claude Chabrol’s Violette Nozière and several films for director Eric Rohmer including Claire’s Knee. Among Laura Morante’s previous films are Alain Resnais’ recent Private Fears in Public Places, Danièle Thompson’s Orchestra Seats, Mike Figgis’ Hotel, and several films with Nanni Moretti including Cannes Palme d’Or winner The Son’s Room. Ludivine Sagnier’s career to date includes two films for François Ozon, 8 Women and Swimming Pool; P.J. Hogan’s Peter Pan (as Tinkerbell), and Claude Chabrol’s La Fille Coupée en Deux. Director and co-writer Laurent Tirard worked as a script reader for Warner Bros and then as a film journalist for Studio Magazine. After writing Le plus beau jour de ma vie for Julie Lipinski, and Prête-toi ma main for Eric Lartigau, he co-wrote (with Molière co-writer Grégoire Vigneron) and directed his first feature, the award-winning Mensonges et trahisons et plus si affinités.